In this post Julia Bailey from the eHealth Unit discusses collaborating with the private sector with particular reference to digital health. Digital health is booming. 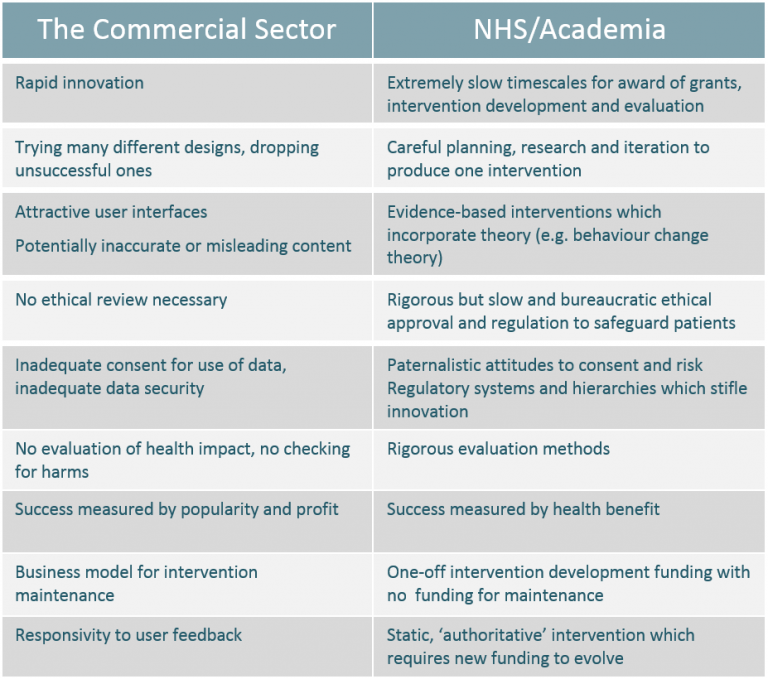 In this article I stereotype ‘the commercial sector’ and ‘the public sector’ to illustrate important inherent tensions between the approaches, assumptions, interests and motivations of different players in the digital health field. Digital innovations can empower patients, improve health, and potentially save health service resources. There are innovation success stories such as Nervecentre clinical records software which is saving lives and NHS resources by alerting clinicians to patient sepsis. Another success story is the Sleepio cognitive behavioural therapy app for insomnia which has been commissioned in many NHS localities. Digital health is fertile ground for the commercial sector, and there is excited talk about how to ‘monetise’ healthcare, and ‘disrupt’ existing NHS systems. Tech companies are stereotypically innovative and dynamic. Small companies can be flexible and responsive, and the short timescales from idea to product can be very impressive. However, digital health innovation can sometimes be characterised by technology in search of a health problem rather than health problems which need innovative solutions, and the vast majority of health apps and websites have not been evaluated to see whether they have health benefits or whether they cause harm. Academics and clinicians can offer clinically relevant, evidence-based design, and rigorous evaluation. Ethical review, data monitoring and regulatory protocols allow for patient wellbeing and safety to be carefully considered. However, while academic research can be thorough and insightful, the timescales of research and development within the NHS are stifling innovation – it can take 5 years or more from applying for a grant to publishing the results, at costs running to hundreds of thousands of pounds. Public sector funding does not support continuous iteration, or a willingness to spend on ideas which might not work. 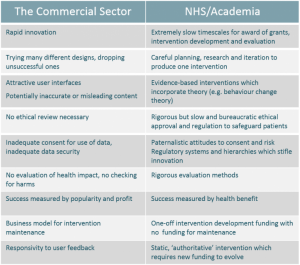 Innovations are implemented in a piecemeal way, and dropping digital innovations into an inefficient organisation such as the NHS without a whole-system review is unlikely to be successful. NHS staff may feel wary of private sector motivation and conduct. For example, the Reed Elsevier group (who publish the Lancet) was involved in organising arms trade fairs until public pressure forced a stop. Pharmaceutical companies invest hugely in advertising and sponsorship which influences doctors’ prescribing habits, and pharmaceutical company research tends to produce favourable results. Patient groups supported by pharma may increase pressure to endorse particular treatments. Public trust has been eroded regarding the handling of sensitive data: for example Care.data was designed to take data from GP records and to combine it with hospital records to find better ways to prevent, monitor or manage illness, but the programme was dropped after public outrage over the sharing of sensitive medical information with commercial entities without explicit consent. In 2015, 1.6 million NHS records were unlawfully shared with the Google’s Deepmind Health machine learning research group. Some mechanisms for app monetisation may engender distrust, for example advertising or selling data. There is a risk that digital innovation is used as a pretext to reduce face-to-face health services. For example, sexual health services in England have been heavily cut with the expectation that 30% of London’s patients will go online to request tests instead of attending clinics. However, the new online system has not been evaluated in terms of its impact on health, workload, inequalities or cost-effectiveness, and clinics have been reduced or closed before the online service was ready to roll out. There is an important tension between ‘profit’ and ‘better health’ as the criteria for success of an innovation. It is tempting to judge the success of a product by how popular (or profitable) it is rather than its impact on health. Both popularity and health benefit are necessary, since an intervention needs to be attractive and engaging to have optimum impact on health. Digital health interventions need technical and clinical updating, which means that an income stream is necessary, but it is essential to enshrine health benefit to ensure that innovations are ethical and beneficial. Collaboration between sectors can play to different strengths to develop high quality, sustainable innovations within reasonable timescales, but all parties need to be aware of any conflicting assumptions, priorities and interests. We need productive cross-sector collaboration (including patients/users) to develop effective, attractive and engaging interventions underpinned by the best available evidence. Acknowledgements: Grateful thanks to colleagues who have commented on drafts of this blog.